BMW’s 2011 Motorrad in Switzerland is being given a push with an advertising campaign using the tag line, “Heaven for Sinners”. 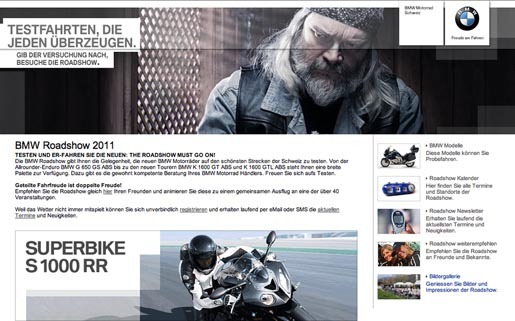 Print advertisement and the show’s web site feature a leather-clad biker in the confessional. “Even angels give in to temptation. Heaven for sinner: bmw-roadshow.ch”. 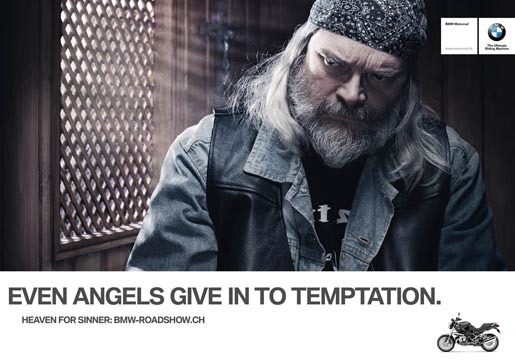 The Heaven for Sinners campaign was developed at Draftfcb Lowe Group, Switzerland, Zurich, by creative director Daniel Comte, art director Andrea Huber, copywriter Boris Beuckmann, and photographer Oliver Nanzig.